Ligth easterlies and cloudy in the morning, turning SSW in late morning. Mostly sunny the latter part of the day. Playback on Garden Warbler and Reed Warbler through the night, from early morning Green Sandpiper, Wood Sandpiper, Spotted Sandpiper and Tree Pipit. Nets open 05.30-21, netmeter hours approx. 5500. A notable fall of warblers in the morning, no doubt much because of the playback. Ringed: Green Sandpiper 1, Wood Sandpiper 4, Greenshank 1, Spotted Redshank 1 (first this season), Great Spotted Woodpecker 1 (first this season), White Wagtail 1, Tree Pipit 6, European Robin 1, Whinchat 1, Common Redstart 1, Fieldfare 1, Grasshopper Warbler 1 (first this season), Reed Warbler 11 (first this season), Garden Warbler 20, Blackcap 12, Common Whitethroat 4, Lesser Whitethroat 1, Willow Warbler 10, Goldcrest 2, Pied Flycatcher 1, Spotted Flycatcher 1, Treecreeper 1 (first this season), Tree Sparrow 3, Greenfinch 1, Common Linnet 2, Reed Bunting 1. Total = 90. Also 5 controls. 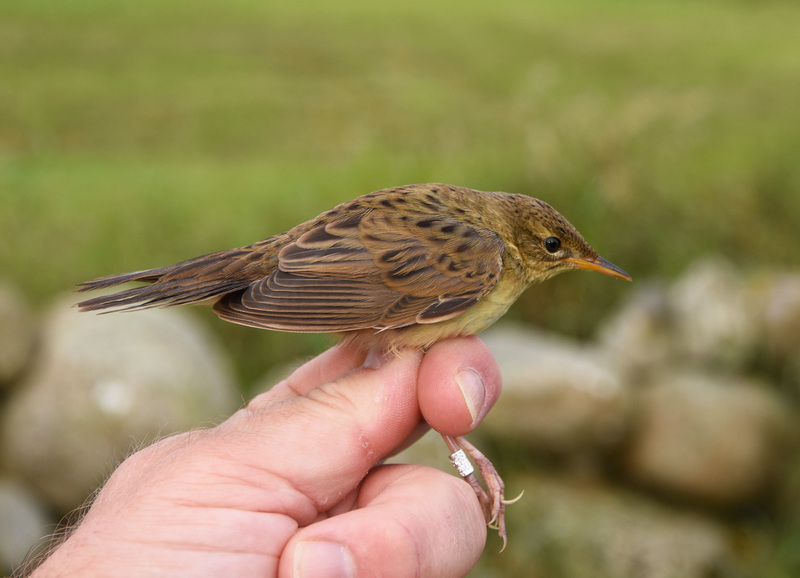 This 1 cy Grasshopper Warbler was the hightlight in a decent arrival of warblers just after dawn, but 11 Reed Warblers was also a good number. Greasshoppesanger 1K. The second attemt at catching a Spotted Redshank by the observatory ponds succeeded. 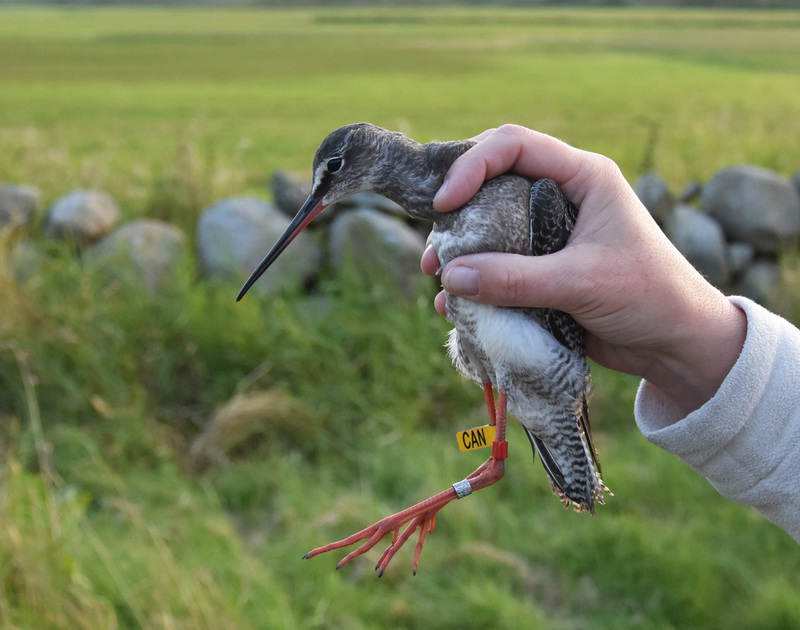 This species has now been added to the Norwegian Tringa project, a red marker on the left tibia and a yellow flag with a 3-letter inscription on the right tibia, similar to codes used on Green Sandpiper, Wood Sandpiper, Greenshank and Common Sandpiper. Haavard Husebö, Alf Tore Mjøs, Renate Berg and Atle Helgesen.